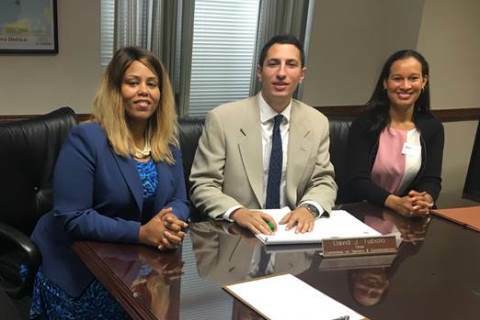 Legislator David Tubiolo (Yonkers & Mount Vernon), Chair of the Westchester County Board of Legislators’ Committee on Seniors & Constituencies, this week hosted Ailsa Gilliam, founder of SheroHub - a Westchester-based women’s empowerment hub featuring educational video games and other technology solutions, and Dr. DaMia Harris-Madden, the County’s Youth Bureau Director, to discuss the importance of ‘domestic violence awareness’. SheroHub, is a Westchester-based women’s empowerment hub featuring educational video games and other technology solutions. SheroHub, LLC was launched in July 2018 to effect positive social transformation around the prevention of, and response to domestic violence. According to Legislator Tubiolo, the meeting was intentionally scheduled for October in order to coincide with ‘Domestic Violence Awareness Month’. The meeting had Ailsa Gilliam introduce a presentation of SheroHub involving youth prevention and awareness regarding domestic violence, along with Dr. Harris-Madden informing how the Youth Bureau helps prevent and will continue to prevent domestic violence. “Sadly, Domestic Violence is not just prevalent in adults,” noted Tubiolo. “A staggering 1 in every 9 female teens and 1 in every 13 male teens have reported experiencing physical dating violence in the last year, while 1 in 7 female teens and 1 in 19 male teens reported experiencing sexual dating violence in the last year,” he added. “The statistics on the prevalence of teen dating abuses are shocking. Sherohub leverages video game technology to raise awareness of healthy vs unhealthy relationship dynamics. Its empowerment provided in an engaging and accessible medium that young people identify with. Let’s work together to prevent domestic violence occurring in young people’s lives so they can live to their full potential,” said Ailsa Gilliam. Domestic violence is the abuse by one person against another in a domestic setting such as, marriage or cohabitation. It may be termed intimate partner violence when committed by a spouse or partner in an intimate relationship against the other spouse or partner. Domestic violence can also involve violence against children, parents, or the elderly. It takes a number of forms, including physical, verbal, emotional, economic, religious, reproductive, and sexual abuse. For more information, contact Ailsa Gilliam at .